Applications for the UNDP Internship 2018 (Communications Assistant) in Sri Lanka is open. UNDP is calling for applicants for Communications Assistant Internship. 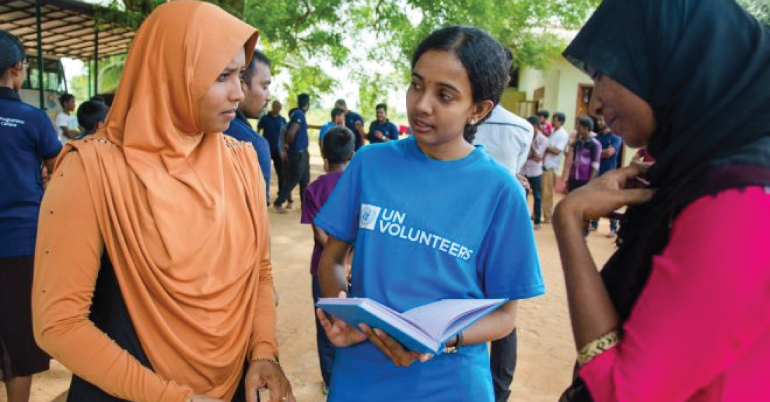 The United Nations Volunteers (UNV) programme is the UN organisation that supports sustainable human development globally through the promotion of volunteerism, including the mobilisation of volunteers. It values free will, commitment, engagement and solidarity which are the foundations of volunteerism. Under the direct supervision of the Programme Assistant and Programme Analyst [PA], the intern will be expected to provide support to the communication functions of the United Nations Volunteers (UNV) Country Office Team. The candidate is expected to work on a daily basis with colleagues in the UNV COT, and regularly with UNDP, UNV/HQ Bonn, UN Communications Group, UNVs, Key Stakeholders, volunteers and the general public. To backstop the implementation of mobile computing. After training and orientation, the intern will provide technical support (Helpdesk) to UNDP staff and Affiliated Agencies. Ensure all UNDP and Affiliated Agencies machines have standardized software and are up-to-date. Accept technical support calls to the I.T. Department and log them in the Helpdesk System. Escalate technical support issues that cannot be addressed by the Helpdesk to the appropriate technician. Troubleshoot and resolve end-user hardware, operating system, and software- related problems, when possible from the Helpdesk. Troubleshoot and resolve basic network and server access problems for end- users, when possible from the Helpdesk. Troubleshoot and resolve issues with LAN, Printers and outlook, etc. systems, when possible from the Helpdesk. Participation in the I.T. Extended Support Program. UNDP works in about 170 countries and territories, helping to achieve the eradication of poverty, and the reduction of inequalities and exclusion. They help countries to develop policies, leadership skills, partnering abilities, institutional capabilities and build resilience in order to sustain development results. Communications Assistant Internship at UNV gives the opportunity to work with this vast organisation. UNDP is committed to achieving workforce diversity in terms of gender, nationality and culture. Individuals from minority groups, indigenous groups and persons with disabilities are equally encouraged to apply. All applications for Communications Assistant Internship will be treated with the strictest confidence. Opportunity to work with UNDP. Good communication skills and ability to work effectively under pressure in a team and in a multicultural environment. Excellent written and spoken English language. Interns are not financially remunerated by UNDP. Costs and arrangements for travel, visas, accommodation and living expenses are the responsibility of the nominating institution, related institution or government, which may provide the required financial assistance to its students; or the intern, who will have to obtain financing for subsistence through private sources. Interns are responsible for securing adequate medical insurance for the duration of their internship with UNDP and must provide a medical certificate of good health prior to starting the internship. UNDP will not reimburse the medical insurance of the intern. Any costs arising from accidents and illness incurred during an internship assignment will be the responsibility of the intern. UNDP accepts no responsibility for loss or damage to personal effects that may occur during the internship.